Personality: Hildrhilt is a very cautious, silent creature, mainly keeping to herself whenever possible. She is quite reserved and rarely socializes unless it is unavoidable, but she attempts to keep the conversations minimal. Despite her reserved nature, she is quite a hopeless romantic, always daydreaming about the day she will find someone who matches her in all ways. Hildrhilt doesn’t mind Hatchlings, finding them innocently curious and she hopes to have some of her own one day. Hildrhilt hopes one day to rank up but for now, she is content with her Citizenship. 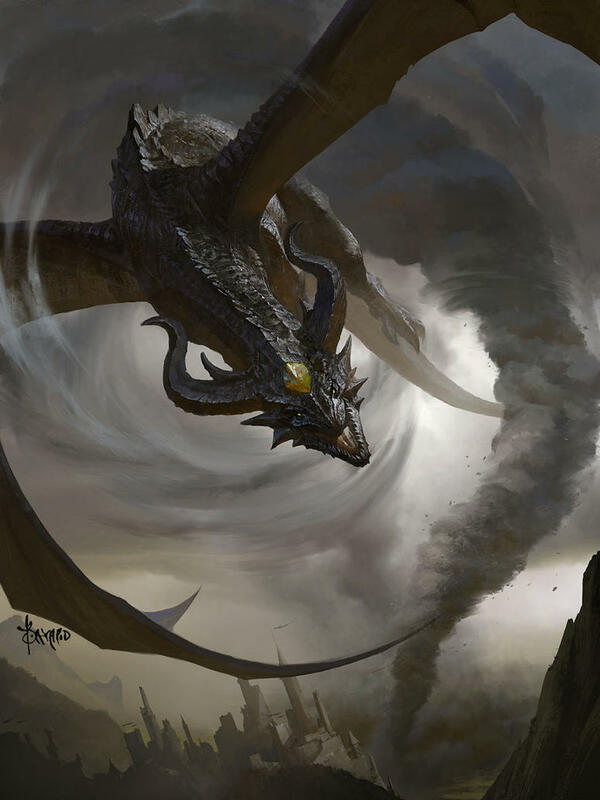 Strengths: Hildrhilt hides well on a stormy day, keeping to the darkest parts of the clouds, so her stealth is quite high on the list of strengths. She is fiercely loyal, her skiddishness makes it hard to catch her off guard, and her mental state is quite balanced. Physically, Hildrhilt is very well muscled but her wings are the strongest part of her, considering her love for flight. Weaknesses: Hildrhilt’s groundwork is her worst attribute, meaning she is terrible at fighting when she isn’t in the sky. Since she is not a full blooded Earthwing, she is only resistant to poisons and toxins and her lightning breath isn't nearly as strong as a full blooded Skywing. Scales: Dark charcoal grey with a earthy brown towards the base for the main scales, smooth along her sides but forming to look like boulders upon her back ridge. One patch of scales directly between her horns the color of autumn leaves, her belly scales a soft, earthy brown. Appearance: Mainly favoring Skywing in coloration, a trait passed down from her father, she takes after her mother in largeness, her horns thick and strong, Teeth and talons sharp. Her wings are long and wide, the bones thin to match her streamline shape with minimal bulk, causing her to fly faster. She is well muscled yet it is obvious she spends more time in the skies than on the ground, the definition found mainly in the base of her wings. Her neck is a medium length for her body, causing her to be able to look at the ground without straining too much when she flies. Special Abilities: Vortex: similar to a tornado but it only works when she is flying, causing the air to spin around her at ninety-five miles per hour to deflect minor attacks, but it isn’t 100%, meaning things can enter the vortex, but it loses velocity. Combat Style: Considering Hildrhilt's groundwork is flawed, she prefers to stay in the sky. History: Not much is known of Hildrhilt’s history, but once I learn of it, I shall document it. Okay so for her earthquake roar, how big of an earthquake can she create? Oh, one last thing, how fast does the "tornado spin?" Approved. Would you like your username changed to your character's name? Done. Welcome to the EarthWing tribe and Twilight Imperium!